The Paradors are a nation-wide chain of Spanish state-run hotels that the Spanish are justifiably very proud of. Some are in really beautiful locations. The Parador here occupies a large seaside location on the Western outskirts of the city of Málaga. Access to the beach is possible, but as elsewhere in Spain the focus is on the large hotel swimming pool. The entire frontage of the estate on the sea is about 3 kilometers long, so some parts have direct views over the sea although a wire fence mostly separates the estate from direct access to the beach. The Parador hotel itself is low-rise, open plan and delightfully laid-back and simple. The Paradors typically try to showcase the best of Spanish cuisine so food and drink is usually top-quality but with a reasonable price tag. 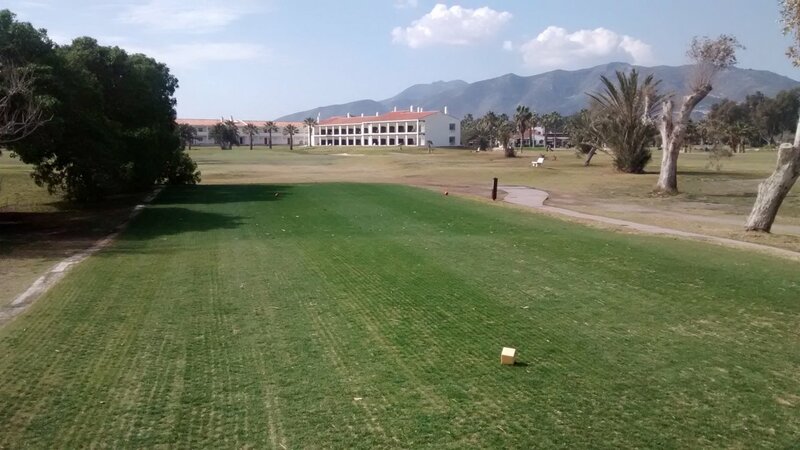 The Parador Málaga golf itself has 3 bits. Firstly there is a tiny pitch-and-putt course (holes about 20 meters long, greens less than 10 meters wide). Ideal for kids really, or other players looking to practice their very short game. 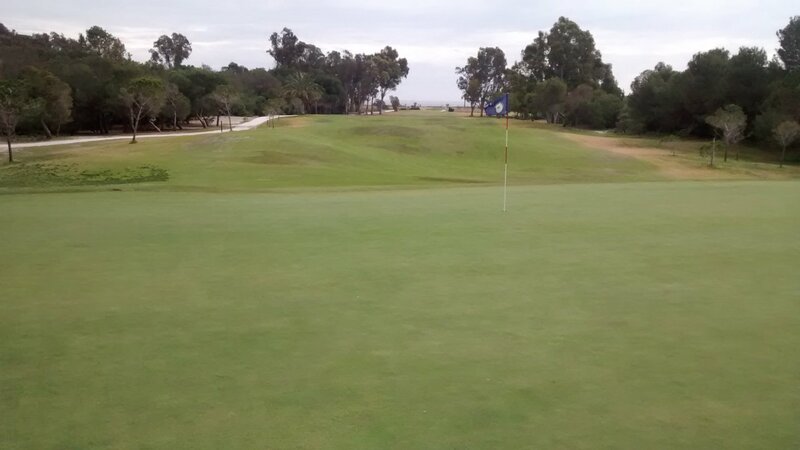 Secondly there is a Red (Rojo) 9 hole course they describe at the Parador as a 'Links' course. It is not really a typical Links course – here that label just means a lot of holes run by the sea. Finally there are two main 9-hole courses – Yellow (Amarillo) and White (Blanco) that together make up the proper 18-hole course at the Parador (what they call the 'Old' course). You can mix and match if you want to e.g. play Yellow+Red rather than Yellow+White. However the Red 9-hole course at par 34 and 2300 meters long is borderline as 'full golf', so not covered further on this Web site. This review focuses on the 18-hole Yellow+White par 72 combination. This course is easy. There are small, simple aluminium hole maps on every tee box, and a simple map of the entire estate on the back of the scorecard. The entire location is flat. Fairways are average width, have gentle undulations at best, and in this parkland setting are mostly lined by mature gum and pine trees - sometimes by bushy areas with stones and sand underfoot. The course is quite cramped, so virtually all holes have an adjoining fairway nearby. Greens are large, rounded, not severely sloped and good quality - soft, smooth and medium-fast. As a mid-handicap player I had little problem getting down in 2 putts from anywhere on any green. There are water hazards on a few holes but it is not difficult to figure out a safe shot that takes them out of play. There are an average number of bunkers, some quite deep, with sand that looks more like dirt than white beach sand. But none very aggressive and sand quality is easy to play out of. For example, green-side bunkers mostly trap quite poor approach shots rather than present a serious challenge. The few bunkers directly in front of greens are avoidable given the large green behind. Of course these water and bunker hazards are going to be much more in play if you are a 25+ handicap player. In fact all the hazards are really designed to a 20+ handicap player standard. During 2014, this club completely relaid their large tee-boxes with fine, soft, very green grass. So the tee-boxes absolutely stand out for their quality. The fairways have more mixed grass – mainly two types of grass growing together. But as long as they mow the fairway grass quite short (which they do), all positions on the fairway are equally reasonable to play off. Immediately off fairways, the quality of grass is not good – spiky and uncultivated. In short, they are not really trying to do anything special with the grass off fairways other than mow it occasionaly. So you get the sparse grass and sandy/muddy patches you would expect in a location so close to the sea. That seaside location and quite open layout means that wind and salt air are a big issue in deciding what types of grasses to plant and which grassed areas of the course to prioritise. So they just do the best job they can in a non-premium course. In addition at peak times of the year this golf course gets a lot of natural wear-and-tear from heavy usage. You have to see this course in context. It is a "nice hotel with a bit of golf attached", not a "good golf course with a small hotel attached". I hear from local people that this course is played by Spanish people 1) working in Málaga who play a bit of golf mostly at weekends, 2) from inland (like Madrid and Seville) who come to visit the Parador with families on holidays where the kids/spouses have pool/beach to amuse themselves while the golfers have a light round of golf. Both are typical "casual golfers". This exactly sums up the type of golfer I recommend this golf course to. Casual golfers. 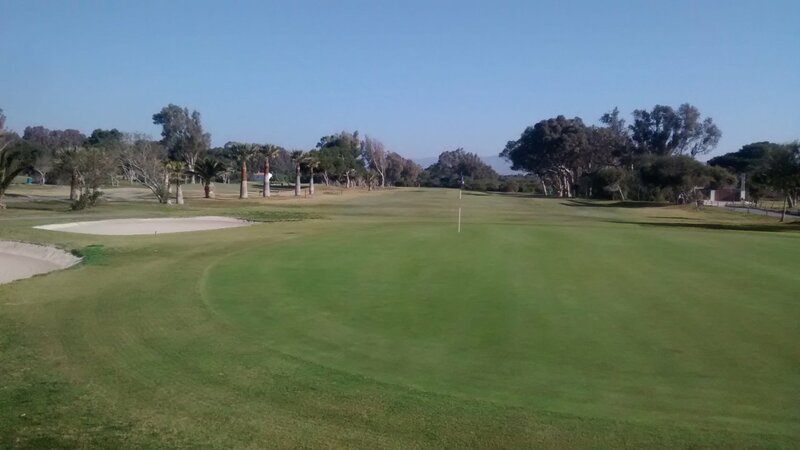 This course is not your typical Costa del Sol golf experience. Not a course I play regularly, because it is a bit too easy for me and has too many repetitive holes. But I thoroughly enjoy the rounds of golf I have there. The course is easy enough for it to be more a practice round than a serious game of golf. The whole atmosphere of the place is charming and the staff helpful in a relaxed and courteous way. I suspect during peak season of Spanish holidays this course is really buzzing with people enjoying the whole Parador experience. IMHO this is not the sort of golf course where you expect people to be easily offended. Prices for golf here are difficult to predict. I suspect quite reasonable, but phone and ask. The prices at this course will probably not change with the seasons in the same way as other courses further West on the Costa del Sol. One final note: This club is directly below one of the main flight paths of planes flying in to the busy Málaga airport. So every 5 minutes a jet may roar overhead. There is no reason for that to seriously disturb your game. Review last updated: February 2015. Number of times played: 3. The 9-hole combination Amarillo+Blanco is represented by the yellow dot. The 9-hole combination Blanco+Rojo is represented by the brown dot. This just shows that the Rojo 9 holes is significantly shorter and easier than the Amarillo and Blanco 9 holes. An 18-handicap player can expect to go around Amarillo+Blanco in 19 over par, and any other combination of 9-holes including Rojo in about 16 over par.